This was a really good article, Frasier. Nice review of the history, and broken down in a way regular people can understand. Great job. Zipping away from their creation. They don’t dally, they don’t dither. they carry past and future within. no time, no wait, just zip! What creates your cosmic speed limit? Thanks, I liked your piece very much. Thanks for this article Frasier, and for helping my uneducated and average intelligence brain / mind obtain at least the tiniest inkling of understanding regarding light and the concept of spacetime. 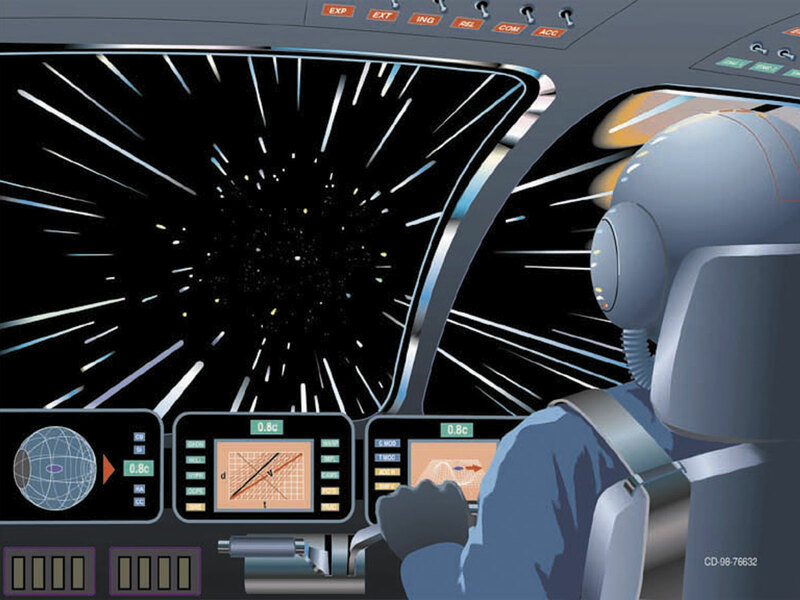 Why can’t you travel faster than the speed of light? Because you can’t travel slower than the speed of light. It’s kind of funny. I have watched any number of programs and read numerous books on Einstein’s theories, as well as taking in similar material on the universe, light, space travel, etc. I ‘get’ the limitations of the energy involved trying to move mass closer and closer to the speed of light, but one thing I’ve always asked myself, and yet to see explained, is what actually limits the speed of light. I mean, photons actually have no mass, right, so what is the speed limiter, the breaking mechanism, that says to a photon “hey buddy, that’s it for you, 186,000 miles per second is your limit.” In a vacuum, with no mass, shouldn’t the speed of light in theory be infinite, even though I obviously know that’s not the case? What am I missing? This article is a case in point. It talks about the science involved in nailing down the exact speed, and goes to great lengths to describe Einstein’s theories on how light always remains a constant, contrary to former thoughts on the matter. But nowhere does it state WHY it’s set at that particular constant. 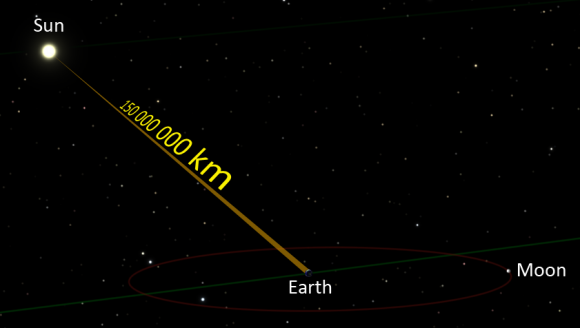 Why not 90,000 miles per second, or 300,000 miles? I, too have wondered about this for a long, long time. See my little poem prior to this post. For many years I believed that the presence of an “ether” was firmly dismissed. However, my amateur studies of “space..” have led me to believe that “space” HAS an ether-like property. Fields? Quantum Nature of space? Interaction with dark energy? Very confusing. I have read that “fields” (one for each particle.. !) exist in space, that the wave-like nature of light requires interaction with ‘something,’ and that the energy ‘field’ at every point in space acts like an ether, etc, etc. I plan to read a lot this winter and take some serious notes. I am NOT a mathematician, but I have a keen mind for analogy creation. Teacher. Basically, c is what it is because the electric permittivity and magnetic permeability of free space have the specific values that they do. Your question boils down to: Why does 1 = 1? The best answer I can give is found in “Beyond Einstein: non-local physics” by Brian Fraser (2015) which states: “And so we discover that the Universe not only has built in mathematics (enough of a mystery), it also has built in unit quantities.” Apparently, all fundamental equations in physics reduce to 1 = 1. The examples given in the article include Newton’s gravitation, Einstein’s mass-energy relation, and the gamma correction factor. The free 22 page paper can be downloaded from: http://scripturalphysics.org/4v4a/BeyondEinstein.html The .html file gives a link to the .pdf file but the former has additional information, and many more links and insights. First let me start by saying this article was a great read. Thank you for writing and posting it. I’m no scientist, but in my mind it seems as though if we could somehow capture light we could use it to propel an object. Does light exert a force on an object it runs into? That is a real question, to which I have no answer. If it does then if a large enough object that had sufficiently low mass was placed in front of a light in a vacuum it would move it right? Again, I’m not a scientist, I don’t profess to understand any of this, they are just questions from a simple mind. Thanks. Light absolutely does exert a force on objects. Though they have zero invariant mass, photons do carry momentum, and can transfer it in interactions with other objects. This is called ‘radiation pressure’, and is the entire basis for the design of solar sails. Minor details to fix: in picture – mps and not mph. This is a good article but thee is no smart money on circumventing the speed of light. That is the most immutable law of this universe. Or perhaps you could suggest that dark energy and dark matter are those moving through our universe at supra-C? What do “Black Holes” and “Dark Matter” have in common? Both of them are indicative that light changes into a form which is neither matter or light and/or evolves into either matter or light in gradations based upon the physical environment in which it is found. Thus, light might not escape “Black Holes” because of the intense gravity in the same but because light, itself, has been altered into another physical form because of the physical environment of the “black hole”, itself. Thus, the preponderance of “dark matter” in the Universe might be explained in this same context. The speed of light, the expansion of the universe, and the “big bang” might, also, be explained in light of the aforementioned. Good article. There is one aspect of the speed of light that is rarely if ever discussed and that is why can’t rest matter be accelerated, which isn’t the equivalent of space expansion, beyond the speed of light. It turns out that its due to the time dilation effect that Einstein described with the famous Lorentz Transformation. You see momentum is conveyed through force carriers which are field photons which move at the speed of light. As a body is accelerated the path of the force carriers to convey momentum are lengthen which lowers the rate of increased velocity per unit of time(seconds) from acceleration. As the body is accelerated closer to the speed of light the force carrier paths are so long that there comes a point where the rate of velocity increase is very very small. Ultimately the force carrier paths get stretched so long that a body never reaches the speed of light but can only get close to it. Invariance of the speed of light in free space. Although this was a good synopsis of the conventional view of light, there are a few points that need to be made in understanding the actual physical mechanism responsible for its velocity. Actually, photons do have a finite, though miniscule, mass depending on their specific energy. The definition of zero mass was given when atomic electron orbital transitions became too cumbersome in calculating atomic mass . The “negligible” photon mass could be eliminated, simplifying the atomic mass calculations Also, antenna reception of EM waves should clarify how the dual charges are inherent in photons. These rotating charges average to zero charge per cycle, but the dynamics of the photon depend on the interaction of these charges. A finding at the LANL plasma research facility was announced at the Los Alamos International Atomic Physics Summerschool class in 1989 that opposite charges interact at right angles, inducing a spin which keeps the charges at a specific distance when balanced against the attraction of opposite charges. Equal charges (with equal finite mass) would perfectly balance, resulting in a specific wavelength depending on the photon energy. Photons have zero invariant mass, at least as far as theory and experiment can tell (well, experiment can only really set an upper limit, of course, but is consistent with it being vanishingly small). Light travels at c in all (vacuum) inertial frames of reference. This is kind of fundamental to special relativity. Also, the Speed of Light is a local phenomenon as opposed to the Quantum Effects, which are non-local, e.g. Wave-Particle Duality, Superposition, Entanglement, etc. May I respectfully point out a glaring error? 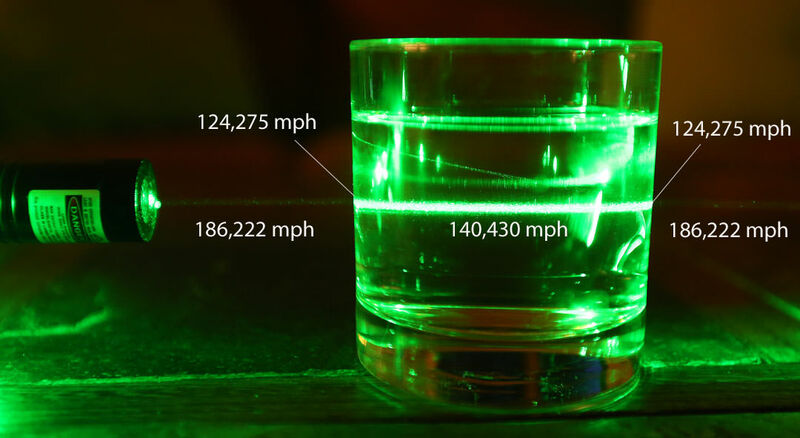 In the graphic showing the speed changes as the laser light passes through various media, the speeds are shown as “mph”. I believe you intended it to read miles/sec. Please correct me if I’m wrong. Thanks for the article Matt. I disagree with ” light moves at incredible speeds and is the fastest moving thing in the Universe”. We know that the influence of gravity moves at the same speed. Really it’s the relationship between space and time that determines the fastest possible speed in the Universe. It just happens that light moves at that fastest speed. So, it’s better to say ‘the speed that light also moves at’ – rather than ‘the speed of light’. The speed of light is constant, if the photons moving in the universe, only where the matter is formed. This Einstein’s claim that the speed of light is the same irrespective of whether the light source is moving or stationary, relatively, there is no rationale. Imagine a stationary light source and another object that is moving away from him at lightning speed. If this object emits light toward a stationary object, it is not one of them can not see the light. What will happen if both objects are going the speed of light in the same direction and the back light is emitted, whether the first one to see the light.? Sure it will. According to Einstein this would not have happened, because the first object escapes the speed of light. Whether it is worth the Doppler effect for light? 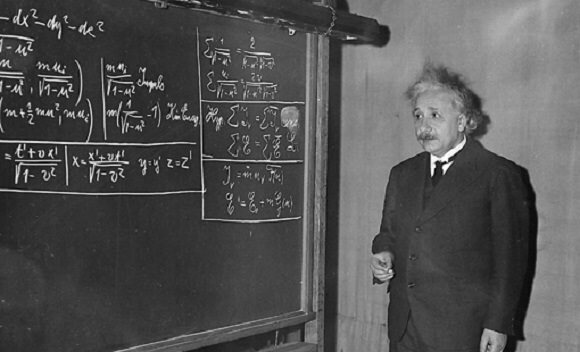 According to Einstein, no, but what is the red and blue shift? Great article. Again. Hmm. Correct me if I’m wrong but doesn’t it take light 0 sec to reach the nearest star? It is for the observer on earth it takes 4,2 years to watch the light get to its destination. If you actually travel at the speed of light, you can go anywhere in the universe in no time. Haven’t done the math lately but I remember the figure 75 years to get to the other side of the universe with a rocket accelerating with 1g. As a computer guy, the analogy that comes to mind is networks, and the information propagation latency of packets travelling through a network. Even there, there is an absolute top limit of lightspeed, but before that, there’s the latency of the switching fabric itself. So, my question is this: In the crudest terms, is the speed of light representing the latency limits of information propagation (a photon) through the ‘switching fabric’ of whatever quantum elements constitute space-time? It’s always been easier for me to think about this stuff in terms of a 4th spatial dimension that measures the distance between quantum bits, which I imagine increasing as gravity and/or speed increases. Thus, the macro-level structures (like atoms and people) perceive time as slowing down, due ot the propagation of information becoming slower as the density of the quantum bits decreases (or distance between the bits increases), as measured by this 4th spatial dimension.